1 422069V Deck - Mainframe 43. 2 422071 Engine - Quantum 45. 3 422046 Cover - Wheel 200mm. 4 ZNB1H000U Nut - M8 Binx. 5 422044 Wheel - 200mm. 7 422041 Washer - Dia. 12.7 Wavy. 8 ZWP1L000U Washer - M12 L.D. Plain. 16 63-11-015 Nut - M10 Flange. 20 422040w Connecting Rod - 48. 21 9362 Screw - M6 x 16. 22 9544 Nut - M6 Nyloc T Type. 23 422032 Bracket - rear Axle. 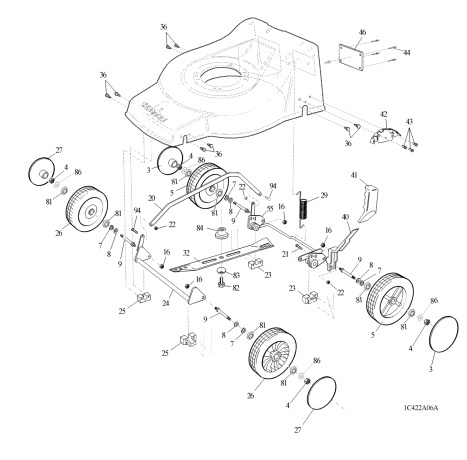 24 422062 Axle - Front W/A. 25 422033 Bracket - Front Axle. 26 422043 Wheel - 180mm. 27 422045 Cover - Wheel 180mm. 29 422037 Spring - C/Balance. 35 1662 Key - Woodruff. 37 9349 Screw - Taptite UNC 3/8" x 11/4". 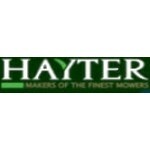 38 300157 Decal - Hayter & Royal Warrant. 39 320006 Decal - Height of Cut. 40 422036 Lever - Height of Cut. 41 422034 Cover - Lever Height of Cut. 42 422035 Quadrant - Height of Cut. 43 9317 Rivet - Dia. 5/32”. 46 422026 Cover - Battery. 47 422001w Handlebar - Lower. 48 ZDH1H016U Setscrew - M8 x 16. 49 9441 Nut - M8 Nyloc. 50 320048 Plug - Tube Dia. 7/8". 51 422012 Decal - Engine. 53 305091w Handlebar - Upper. 54 340179 Lever - Engine. 55 422063 Axle Assy - Rear. 56 9472 Washer - Plain M6. 57 305093 Guide - Rope. 58 226024 Bolt - Handlebar M8 x 45. 59 226013 Knob - Handlebar Triangular. 60 305127 Guide - Rope. 63 422014 Cover - Stop. 64 340182 Pin - Pivot. 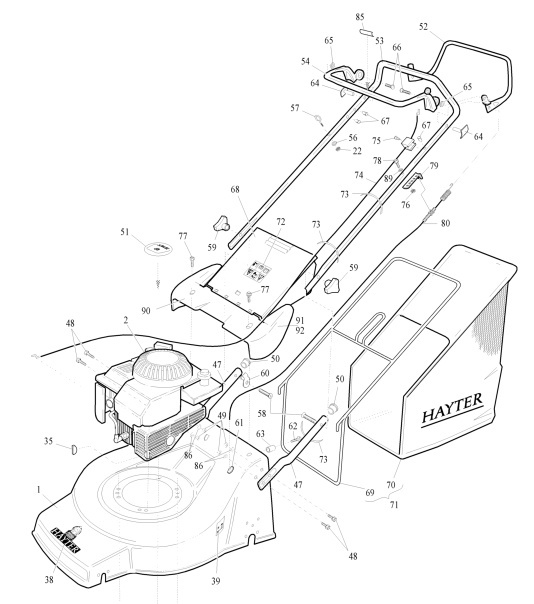 65 9688 Washer - Nylon. 67 300144 Fastener - Drive. 68 422065 Deflector - Rear. 69 422002w Frame - Grassbag. 70 422003 Grassbag - Fabric. 71 422010 Grassbag - Full Assembly. 72 219189 Decal - Caution. 74 312002 Cable - Engine Brake. 75 9358 Screw - Taptite M5 X 35. 77 9546 Screw - M6 x 12 Taptite. 82 9118 Bolt - 3/8"UNF x 11/2". 83 MU17x137 Washer - Friction. 84 MU42734 Blade - Adaptor. 85 331046 Decal - Engine Stop.